Jetzt unseren wöchentlichen Newsletter abonnieren und keine Andrea Gibson Veranstaltung mehr verpassen. “Do you want to hear the best story you’ve ever heard in your life?” Andrea Gibson asks into the microphone. The audience leans forward in silent anticipation. “So I met this woman and I went home to her house with her.” She pauses, “already a great story.” The audience erupts with laughter, a happy juxtaposition after being so quietly captivated. Smirking into the spotlight, Andrea continues, “…So we’re about to kiss for the very first time. And right before our lips touch, she jumps from the bed, runs to the closet and grabs a stethoscope, puts the ear thingies in my ears and slides the knob down her shirt onto her heart and says, ‘I want you to listen to my heart speed up when you kiss me.’ And I kissed her! And her heart got faster and faster y’all.” By this point the room itself almost feels like a stethoscope pumping with the galloping hearts of the fans. “Moral of the story, buy a stethoscope,” Gibson says, and there’s that laughter again, followed by music, and they launch into a love poem – with the members of the audience mouthing along. Whether their art is de-stigmatizing mental illness, encouraging people to stay alive, bringing visibility to queer relationships, or inspiring activism that dismantles patriarchy, capitalism, and white supremacy HEY GALAXY does feel brave. On stage at packed clubs and theaters around the globe, Andrea will often announce that their biggest fear is public speaking or matter-of-factly announce that they are having a panic attack in the middle of their performance. This attitude might seem strange during a traditional show, but feels right at home here. 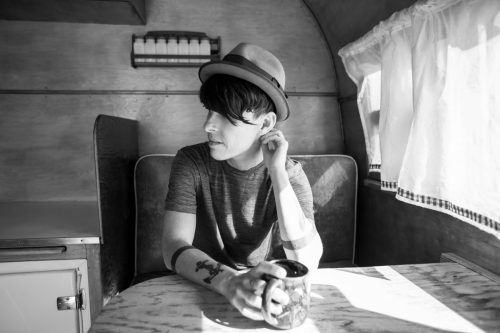 The vulnerability of Andrea’s honesty makes the audience feel welcome as they are, which brings them back to Andrea Gibson shows time and time again.